‘Tis the season for squash! With my mom in town, I wanted to make a comforting dinner that tasted as good as a restaurant-quality meal–> without having to leave the house! We both love curry-flavored dishes, so I had a feeling this soup would be a hit. 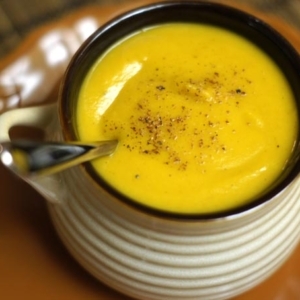 A creamy, dairy-free soup that's perfect for Fall squash! In a large stock pot, heat the coconut oil over medium heat and saute the garlic and onion for about 15 minutes, until the onions start to caramelize. Use a splash of water, if needed, to prevent sticking. Once the onions are lightly golden and tender, add the curry powder and saute for 1 minute. Add the squash and water, and bring to a boil. Once boiling, reduce the heat to a simmer and cover for 20 minutes, or until the squash is tender. Transfer the soup, in batches, to a food processor or blender, and blend until velvety smooth. Add in the almond milk, then blend one more time until creamy. Transfer the blended soup back to your original pot, season with salt, to taste, and reheat on the stove until piping hot. Serve hot, with a sprinkling of freshly ground nutmeg on top! My mom agreed that this was just as good as any fancy restaurant’s soup. Hope you all enjoy it as much as we did! This was fabulous! I added 3 tablespoons of cooked quinoa and a dollop of plain unsweetened Greek yogurt. So delicious! Thanks! Cooking any squash in the slow cooker is as easy as it gets! Directly to the slow cooker with cups of water, low for 8 hours. Done! Comes out super soft and easy to cut. Cut in half , scoop out seeds and discard. Scoop out squash and go from from there! I made this today exactly the way recipe reads! Love it!! Just finished eating this for dinner as part of a 21 day detox plan & it was delicious. I used 2tsp curry instead of 1.5tsp for a little extra spice, topped with a bit of nutmeg & fresh ground black pepper. Also used coconut milk instead of almond & it was perfect. Love this soup! Will definitely make again. Can’t wait to try more detoxinista recipes! Wonderful recipe! Easy, healthy, yummy! This was yummy with curry. And super easy to make. I did add some spice-I needed some heat! And fresh pepper on top. Thank you! I love using butternut squash in recipes but find it difficult to peel and seed the squash. Do you have suggestions on how to make that part easier? We loved this! I doubled the curry, because we love our curry. Thank you! I’m so glad to hear you’ve had such great results! Congrats!! yum I love curry & butternut squash can’t wait to try this recipe! Awesome! I just has a butternut squash soup recipe posted on CrazySexyLife.com – it seems like this is the soup of today! 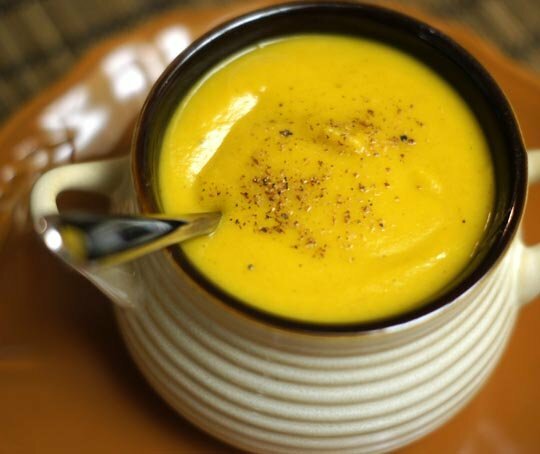 I’ve seen a few other blogs with butternut squash soup recipes! How can you go wrong with something so sweet and nutritious? Nom nom. I make this with steamed sweet potatoes & carrots instead of butternut squash. I think I will try it your way next time!